The Rotating Equipment Division of Kemlon has maintained a reputation of reliable service and consistent quality, in the Petroleum and Petrochemical Industries since 1950. Three manufacturing facilities with headquarters in Houston, Texas, insure prompt delivery on new equipment and spare parts. Strict quality control and inspection insure that all equipment and spare parts are manufactured from the best materials and to exact and proven specifications. This quality control is made possible by our total in-house manufacturing capability. Kemlon offers a complete line of dampeners to remove or reduce pulsating surges in your process due to the action of reciprocating pumps.The simplicity of the dampeners make them easy to install and operatewith virtually no maintenance required. By using a reinforced teflon diaphragm (metal diaphragms are used at pressures over 2000( PSIG), and aselected process base or reagent head construction from the variousalloysteelsor plastics available, the dampenereasilywithstands corrosive acids or solvents that attack and destroy conventional elastomeric bladder type dampeners. Kemlon Pulsation dampeners are designed to smooth out the pulsating flows generated by positive displacement piston, cam, roller, gear, and diaphragm pumps. All Kemlon dampeners utilize a gas chamber isolated from the process side by a diaphragm. Positive displacement pumps handling non-compressible fluids will generate significant pressure surges due to the rapid acceleration and deceleration of the liquid during the sinusoidal cycle of the pump. This problem is often evidenced by hydraulic hammer in process lines, large pressure fluctuations, excessive wearand maintenance of pumps and instruments, and high instantaneous current measurementon electrical input to pumps. The dampener operates by absorbing a volume of liquid during the discharge cycle ofthe pump which displaces the diaphragm and compresses the gas in the gas chamber. Then, on the suction cycle of the pump, the fluid in the dampener is forced out by the compressed gas acting on the diaphragm, resulting in essentially smooth flow. This action enables the liquid to keep moving rather than accelerating, decelerating, and stopping, as happens when a dampener'is not utilized. In some instances, the Kemlon dampener may be used to increase suction NPSH to the pump. This may be desirable in instances where suction lines may be small or lengthy, where viscuous processes are pumped, or when using high operating speeds. Kemlon dampeners should be located as close as possible to the pump. The unit may be mounted in any convenient position either vertically, horizontally, or at any angle. A recommended charging pressure of 80% of the intended operating line pressure is advised for initial operation. This may be easily adjusted, however for optimum efficiency in your process by use ofthe gas charging valve and pressure gauge that accompanieseach dampener. For convenience, Kemlon can pre-charge dampeners with nitrogen for immediate operation. When choosing the correct size dampener for your process, it is necessary to determine the displacement per stroke of the pump. Total gallons per hour (GPH) or minute (GPM) is not considered since this is determined by the stroking speed of the pump. Using the chart below, select the dampener model which has suitable materials of construction, falls within the pressure range of the process, and has liquid capacity greater than, or equal to, the displacement of one stroke of the positive displacement pump to be utilized. Max Pump Disp/Stroke Cu. In. *All units can be supplied with a welding neck flange as an option except for model 100 K.
The Kemlon dampener can stabalize suction flow velocity and prevent cavitation. When employed in the suction line of a reciprocating pump the dampener enables the diaphram or plunger of the pump to fill the chamber on the suction stroke without cavitation. This is accomplished when the inlet to the pump os at its lowest rate, by the dampenerzccumulating the diffrence between the flow rate anf the mean flow rate. Thenm as the suction intake increases. the dampener discharges the diffrence between the mean and the maximum which is required. 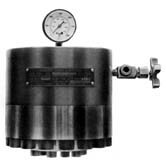 The SERIES 100, although originally designed to compliment the Kemlon Bullfrog pump, may be used on any positive displacement pump with displacements of 10 cubic inches or less per stroke. The 2000 PSIG pressure capability and the relativly large capacity of the SERIES 100 make this dampener the most popular in the Kemlon line. The SERIES 100 is available in numerous materials of construction, including AISI 316 stainless steel, Hastalloy, Monel, Ductile Iron, Kynar, Alloy 20, Steel, and Titanium. A one inch NPT female connector is used to permit easy installation. Flanged connections may be provided on request (Kynar dampener has a 1" 150# RF flange as standard). The unit is shipped complete with charging valve, gague, teflon cord diaphragm, nitrogen gas charge, hydrostatic test certificate, and is ready for immediate operation at your plant. The SERIES 200 is similar in design and operation to the SERIES 100 but is utilized where larger pump displacements of between 10 and 20 cubic inches per stroke are found. The dampener utilizes one reagent head with a gas dome mounted on each side. A reinforced teflon diaphragm is used between each dome of the reagent head, thus confining the process liquid between the two diaphragms. The two gas domes are connected to each other by high pressure tubing thus insuring an equal gas charge in each dome. 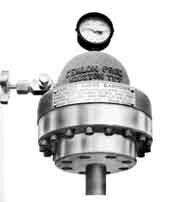 A pressure gague is mounted on one dome so that the gas charge within the two chambers can be monitored. Like the SERIES 100, a one inch NPT female connector is provided for eash installations in processes up to 2000 PSIG.